" You wake up one morning and you're a star"
I have been waiting for this! 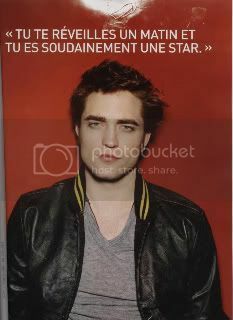 Here it is girls, the translation for the French Premiere article featuring our boy, Robert Pattinson. Lots of new stuff. Click here for the full article thinkingofrob. Thank you so much! Last year for Twilight it was Paramore's Decode, for The Twilight Saga: New Moon's official theme ( I presume) it will be "Meet Me at the Equinox" by Death Cab for Cutie. The song was specifically composed and recorded for the second Twilight installment and it will be unveiled on MTV's website during the broadcast of the MTV Video Music Awards on September 13, which incidentally is Bella Swan's birthday! It will be the first single off the soundtrack which will hit the stores October 20, 2009. For pre-order of the New Moon Soundtrack, please go here. I know you guys love anything Rob so here is an old GM.TV interview he did in December 4, 2008. So, you would know what to do when you see him in the street. I don't know about you but I totally love it when he says..."at all". Oh that accent! It gets me everytime. Enjoy! It's like Christmas all-year-round, having Rob on your wall with this perfect 2010 Calendar. Order yours here now! Edward & Bella... I'm Yours by The Script. To our friends, readers since you made our hearts bigger with all your love and support. We give you Edward Cullen, Bella Swan, and Ireland's best band since U2, The Script.Gorgeous vid by daemonneko. The leader of the wolfpack has arrived! 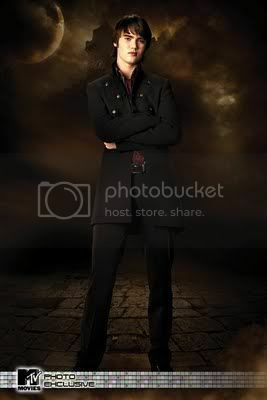 We give you Chaske (pronounced as Chess-Kay) Spencer who plays Sam Uley in the The Twilight Saga: New Moon. The hot 34-year-old is of Cherokee and Sioux heritage. 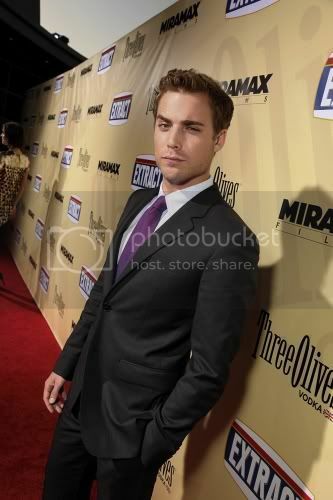 Check out more of his sezy pictorial at twigossip. Okay we are now convinced that David Slade is playing favorites here. This is the second time he tweeted with Taylor's picture. Kidding!!! Is it just because he is shooting Taylor's scenes first? 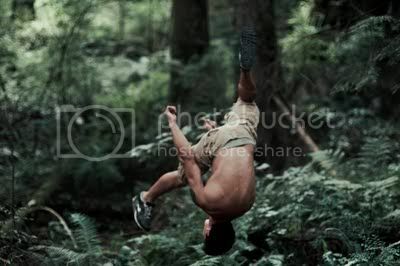 Or is he amazed with Taycob's athletic ways? We are no mind readers, so my answer would be, "Give us some Edward and Bella!" Again, I have to admit the action shot is perfect! Okay Mr. Slade you already captured all Taycob fans and you're getting us all excited. Ooooh, I am expecting an Edward/Bella twitpic very soooon. Yet another stupid headline. Poor Rob. I don't think these kind of stories will stop anytime soon. In any case they provide us our comic breaks. An online sports betting site has offered odds on which nine celebrity bachelors will be the next to become a father. And Rob leads among the crop. I think these people who are betting on Rob were convinced that he and Kristen are really on the "planning" stage of having a baby. My goodness! We blame that on Australia's NW magazine, which gave us the funny "exclusive" last July. Again, like we say here in Robtenation its too stupid yet to funny to pass. Read more on the "shockingly" lame report . Laugh at your own risk. David Slade Tweets again. It's Taycob this time! It seems that the Twilight Saga: Eclipse's director David Slade is really being super friendly with the Twifans. He tweets (for real) and this time he included a beautiful Jacob Black closeup. The lighting is superb! It seems I will have a much higher expectation for Eclipse. I am a fan of great cinematography and looking at this picture is making me wanna watch a David Slade film so I would know what to expect. Oooh, Eclipse is also getting me so excited and to think it's slated for June 2010. 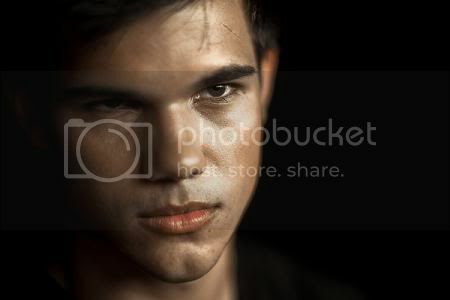 He tweets "Mr. Taylor Lautner - A photo I took during early camera lighting tests. Not a whisker in sight." - And for that Mr. Slade, we are expecting a twitpic of Edward and Bella REAL soon. 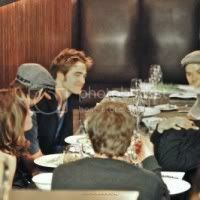 The Twilight Saga: Eclipse cast, at least the Cullens, and Robward had dinner at the La Bodega Restaurante and Tapa Bar at Howe Street in VanCity. 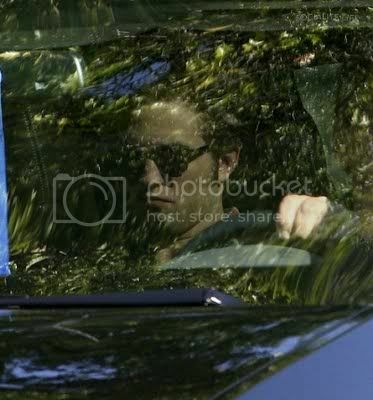 Kristen was nowhere, and said to be spending some quiet time with mom and brother, Taylor. More pics at spunkransom.com. We luv you Kristin! Because you guys deserve something to believe in. There is a reason for that cheezy line. Edward Cullen is indeed the perfect creature! The high cheekbones, strong jawline, straight nose, and full lips. Those topaz eyes, and the bronze colored usually messy hair, oh the hair! The same perfection that is Robert Pattinson, except for the eyes. Edward Cullen is Adonis-like and is impossibly beautiful! We know it is too early to compare which Edward is the most "exquisite" should you prefer to pick early on. We are giving you a quick photo review. 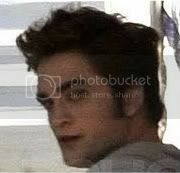 Twilight Robward - We would miss the bouffant lol. 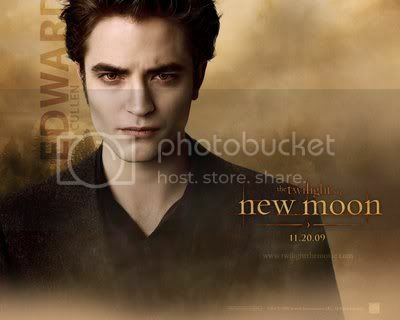 New Moon Robward - So serious. Can't blame the crease between the brows, gotta blame the NM storyline. Eclipse Robward - Too soon. I think he would be sexier here, since there is competition in Jacob Black. He needs to put his game face on. Oh! its so wonderful to be Isabella Marie Swan! Taylor in Teen Vogue, looking hot and dirty. Uhmm, another dirty boy. Eclipse's Bella Swan does not disappoint. Wig and all (or hair extensions? 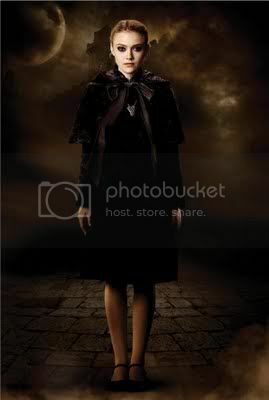 ), Kristen is back as the brown haired beauty from Forks. Pictured here getting geared up for the graduation scene where Charlie Swan played by Billy Burke also attends. Now, we need to see pics of the two vampire graduates, Edward and Alice Cullen. Hurry up, please. Wow, yellow gowns! Kris, Rob, and Catherine at the Twilight Premier in Rome last year. I loved Lords of Dogtown, first because Heath Ledger was in it and I think it was so fresh and appealing. 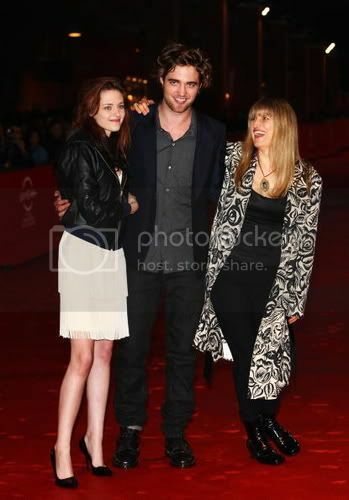 That is how I came across with the feisty, Catherine Hardwicke. Of course, with her spearheading Twilight last year, only made my love for her tripled a hundred times over. Not only she casted the perfect Bella and Edward but because she never fails to make her audience so involved with her characters. And her movies are never predictable, like Thirteen, and I always love the indy feel that she brings to it. With her latest interview, she again filled us on some more deets about scenes she planned in doing but was cut because of money-issues, including the "blood typing" scene. 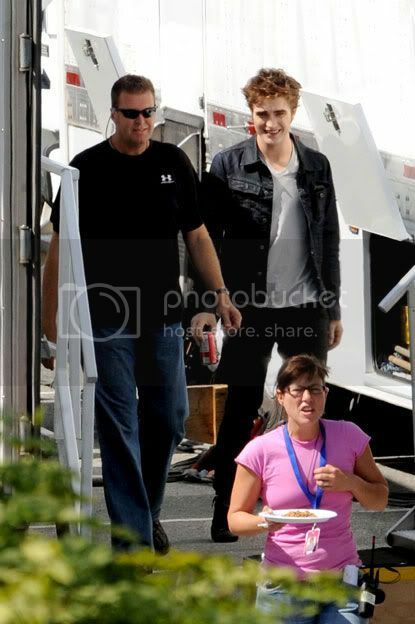 That was a big loss for the fans, I would have loved to see Rob carry Kristen to the clinic and sneer at Mike Newton. Summit really was beyond being clueless to how big Twilight was going to be. She also outed Rob (again) and mentioned his "style" during the last Teen's Choice where Twilight took all 11 major awards. Yep, it is now confirmed that his red plaid shirt was the one his buddy Marcus Foster wore the night before when he had a gig. Who really owns it, nobody knows yet. This is what makes Rob endearing and I am not planning to call a stylist anytime soon, only for the Oscar's perhaps. Click herefor the rest of the article. I am sharing this with you because it's a lovely video and I love Selena!It covers a lot of behind the scenes from Twilight, the Rome Premiere, and the heavenly Vanity Fair shoot! Great vid from Isleme09. This is soooo cute. Since we are missing Kristen. We decided to post this one. It's her first live interview. She was promoting "Catch That Kid" and it was with Ryan Seacrest. Even then she was such a cute kid, always a bit shy, passionate about music ( just like Rob), prefers the oldies...er classic (just like Rob), and they really have the same mannerisms with the hand in the hair and all. Okay, enough snogging for the day. Enjoy! Thanks to MegaTwilightFan1918! 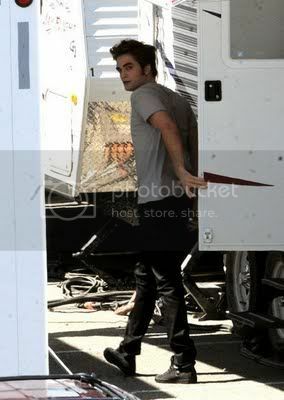 After further inspection, I think it is safe to conclude that Rob is indeed already in character in these pics. 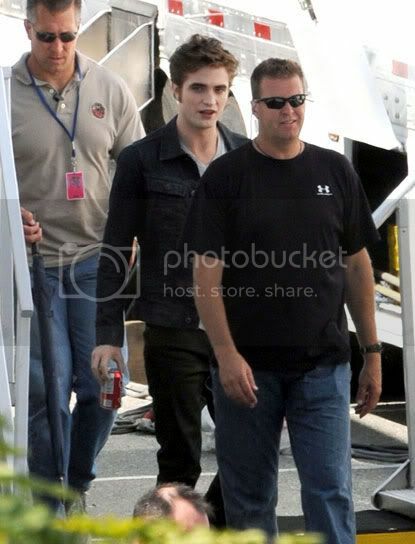 Rob does not usually wear pasty foundation and that definitely is an Edward Cullen jacket. The Coke, of course is signature Rob. I wonder how they are able to sneak out Bella with no pictures. The Eclipse security is quite impressive. Come on, just a teenyweeny glimpse please! We are missing Kristen, badly! 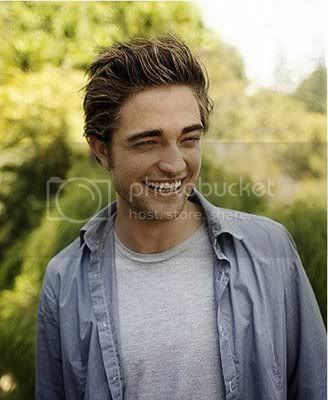 pics from robertandkristen.org. We heart you! 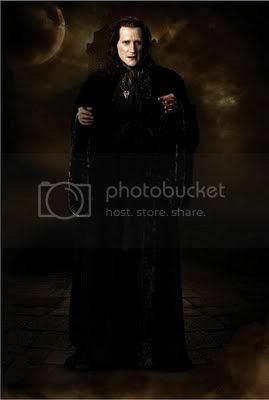 After all the manips, here it is finally... the The Twilight Saga's Volturi. Our top faves are Aro and Caius! Really scary. Marcus looks lost, like he came from a Frankenstein movie. Alec is looking really hot and bothered lol. and Jane is fierce.. with her maryjanes. The drought that Rob caused for a week is over. He decided to be seen on set today looking dreamy as usual. He reported for "serious" work today. Seriously, David Slade is being charming to the gazillions of fans for tweeting and all. But we also appreciate him for keeping everything under wraps for the safety and privacy of everyone involved in the shoot and that includes Rob and Kristen. We all know why the two deserve more privacy now, right? Deets include secret sources saying that scenes include a "meadow" scene were shot where Edward and Bella rolled a little, talked bout getting hitched (nope, not that leg hitch scene, ladies), and agree on a wedding date. 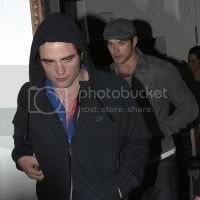 Thank you Rob for wearing the grey shirt! We missed it, too. It has been too long. LOL. Btw, is Rob being Edward already? He is already wearing makeup, right? We can't tell, it's too far. We need a closeup of Eclipse Robward real soon. This is all getting more exciting by the minute. 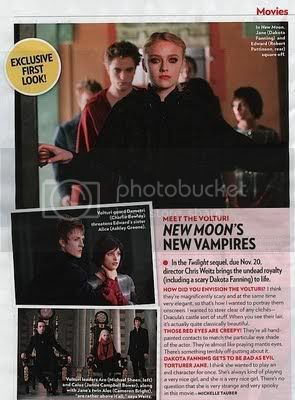 People Mag gives a glimpse of what to expect when the Twilight Saga: New Moon hit the theaters in November. 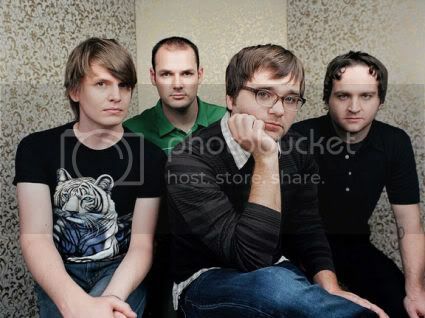 Look at Robward looking so serious. Oh is Jane there? I hardly noticed. I was looking for Bella. The tent scene. Chapter 22. Fire and Ice. Whole chapter please. End of Chapter 20 Compromise page 459-460. I am also sure you have your own "MUST SCENES" and I bet the above two are on top of them. Oh, yes. 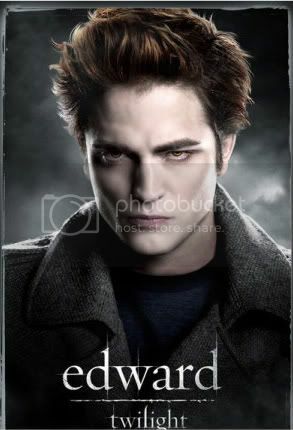 Fire and Ice will be a tough scene to direct with Edward just "mind reading" Jacob and all. 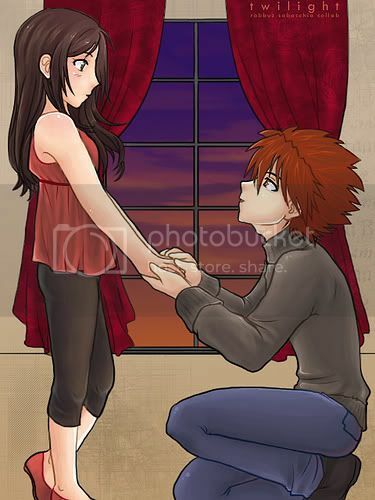 The formal proposal scene is of course a major one, as well. I wanna see Robward getting down on one knee and proposing to Kristen, no I mean Bella. Haha. gotcha there! Of course, that "leg-hitch" that all the women, matured girls lol are all waiting for. Mr. David Slade, its at page 186 chapter 8 Temper of your holy twibible. If we need to petition this we can do so, just tell us as early as now, ok? I know you guys are out there. No need to lurk around. Share with us how you feel and your Eclipse expectations. Maybe we can tweet them to Mr. Slade, right? Just saying. 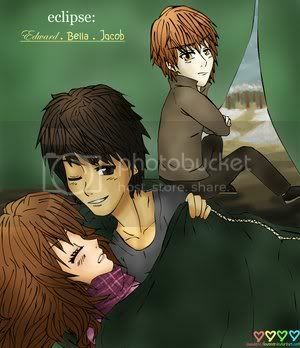 The Robstenation heart goes to sasukee23lover for the beautiful artwork. Holy Batman! 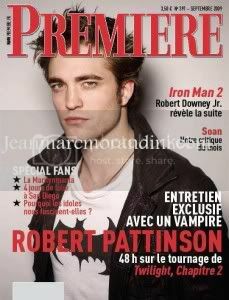 Rob is in the cover of the French Premiere. 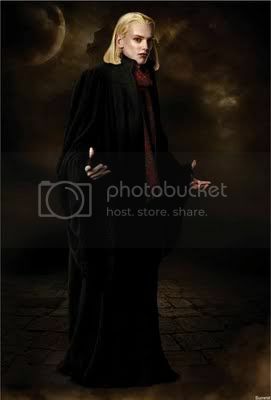 So, the mystery of the unknown photoshoot is solved. 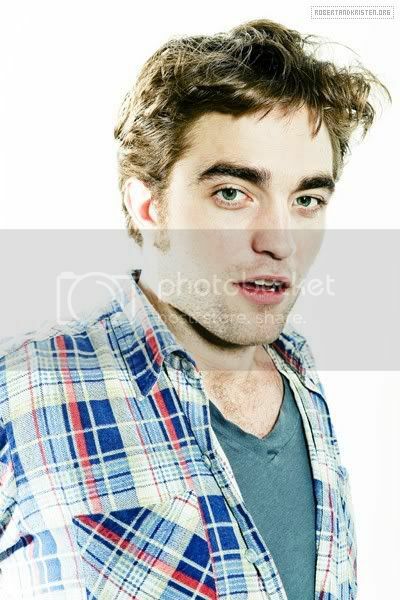 And, we are now expecting bigger versions of these fab Rob photos, soon I hope. Once its out we'll be awaiting for the translation, okay? We are hoping something new in this article. This is an oldie but def a goodie vid. I just luv watching Rob here looking so shocked and flustered. 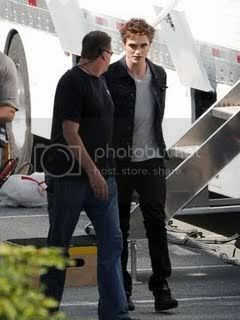 I bet he is not missing TomStu since he is "busy" with our girl, Kristen... shooting Eclipse. And you thought, I was going to say something else. Uhmm, naughty!You have got to admit this is beyond cute and bizaare, as Rob puts it. And girls, he is not into inking so don't even think about it.This is for Kristina/kristaynuh! We heart you! Again, as her willing subjects, when The Twilight Saga queen bee speaks we listen. Summit should not be spared! She said she thinks there should be five, give her 5! Come on Summit, four is such a lonely number. That only means more money for you and more Robsten fun for us!Thanks to ThatTwilghtSagGirl2. It has been a week since production has started for The Twilight Saga: Eclipse and David Slade already confirmed Rob and Kristen shot scenes but I have yet to see Kristen as Bella again. I need to see her all brown-haired, pale, and very beautiful. We bet Robward will have a hard concentrating ...again. Another US photo. Wet Rob Hotness! Need something for your Robsten rush? Here is a 1-minute quickie. Oh you know you need it. Another cutesy vid from Andreia L.
And you think it will never end. More Comic Con pics from breaking-dawn.fr. These are the cutest from the bunch. Oh, we miss Rachelle already! Hey, Nikki let go and give her Rob lol. Kellan is charming as ever. More wonderful Comic Con 2009 portraits. The Twilight Saga: New Moon Trinity with director Chris Weitz. 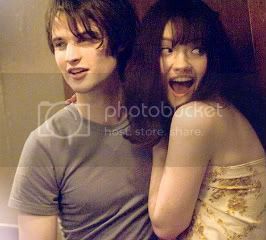 Talulah with Tom Sturridge in The Boat That Rocked. British actress Talulah Riley must be really lucky to land roles opposite both BFFs Tom Sturridge and Rob Pattinson. The 24 year-old beauty from Nearly Famous is Jane in The Summer House and Marianne in The Boat That Rocked. Don't worry girls, she is already engaged to Elon Musk, so no need to fret. Check out The Summer House trailer, with that HOT scene. Phew! Thanks to bohemiansnitch for the vid. Midweek blues? We give you Rob! Kristen Stewart is for Team Edward or Team Jacob? A green light for Breaking Dawn? 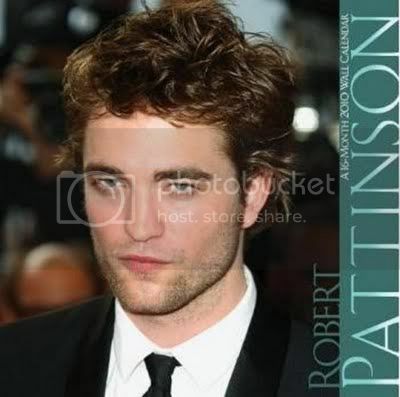 Edward Cullen's BFF has been casted!